Worth of money in parallel worlds. $100k invested in Jan 2010 will be end up very differently based on investing habits. A projected scenario of $100k when invested in different conditions starting on Jan 1, 2010 (arbitrarily taken for this example). The goal is to not show which one is better but highlight how different investing opportunities can have very different outcomes. 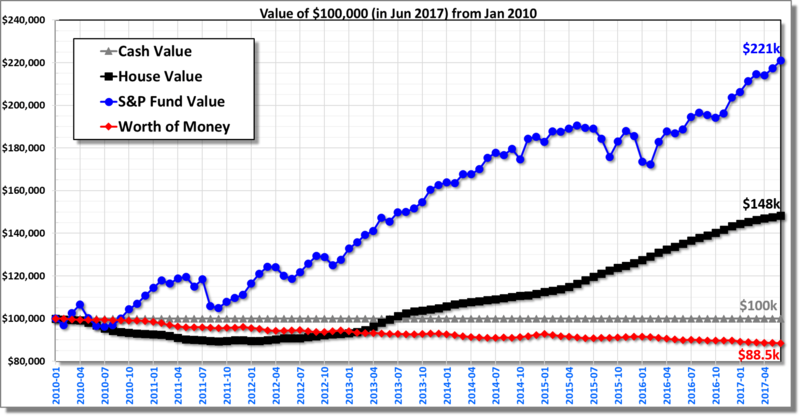 In this time frame, investing in S&P index will more than double the money although housing has been a bright spot too & would have resulted in almost 50% increase (when invested in a house in Portland Metro). Money kept in the bank will barely grow but inflation will eat into it & what that money can buy at the end of this time period will reduce by almost 12%. Click on image to enlarge. Source: The monthly S&P and CPI data were taken from Prof. Shiller’s page (link to excel data here). The housing data taken for Washington county (zip 97124) from Zillow (raw excel data here). For re-investment of dividend, I took monthly dividend from Prof. Shiller’s page and calculated the amount of S&P stocks one could buy from previous month’s dividend (another way, from PK & Cameron, for similar calculation but this is a good approximation for a general overview). No fees or charges are included. The bank account is assumed to have no interest, although some accounts provide small returns.